Sometimes I wonder if I am actually a wildlife photographer, as at times, I seem to spend a lot of time behind my computer, not out in the field making pictures, where I want to be. So after a time spent in front of the screen writing about Shetland otters, the weather looked good enough to go out in search of Shetland otters and get me away from the office, if only for a few hours. I headed out to an area where I know a female has three cubs, being mid-winter it was 8:30 in the morning and still semi-dark. This time of year in Shetland, it does not get light till gone nine and then by early afternoon it is starting to get dark again. Shetland is the most northerly island group in the UK, and at the same latitude as southern Greenland, the days are short at this time of year, with the shortest day on 21 December, three days away. I pulled up next to the bay, where I can sit in the van and scan the coast. I had stopped at the local shop and got myself some nice hot pies, which is not the healthiest breakfast but they were incredibly tasty. I sat there in the van, scanning the shoreline waiting for it to get light. There were regular heavy showers, blown across the sea onto the shore, in a moderate westerly wind, making the sea quite rough. Otters can be difficult to see in large waves; at one point I thought I saw what might have been an otter, across the other side of the bay. However, not seeing it again I put it down to the waves crashing on the shore. By 9:30am the showers had stopped and it was getting brighter, I grabbed my gear and started walking along the coast. After a short walk round the bay, I found the mum and three cubs, in the area had been scanning from the van. 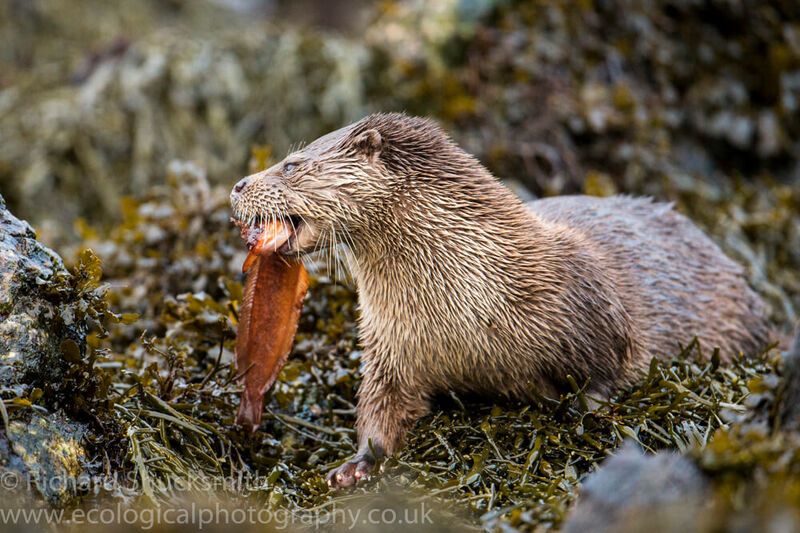 This really brought it home the difficulty off seeing otters in rough seas, particularly at a distance. 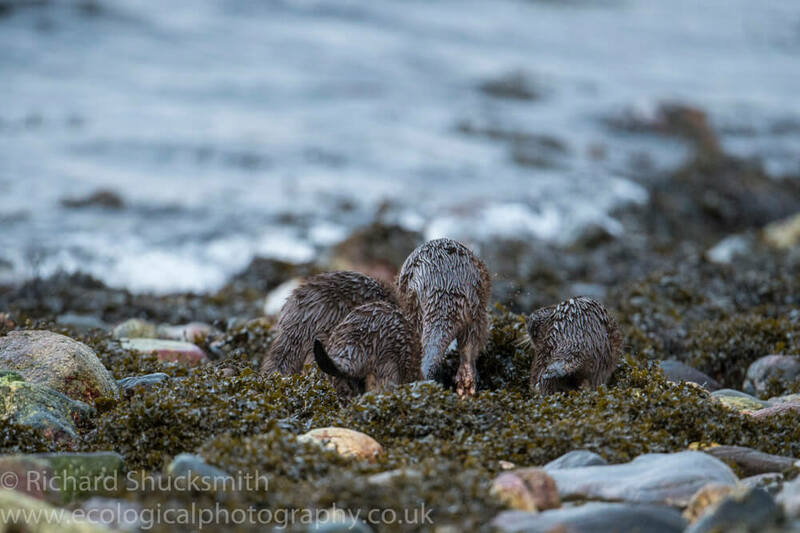 As I slowly moved into position to photograph the female and her cubs, I noticed another otter feeding about 20m out to the left. I found it a little frustrating that I had just been scanning the whole bay for the last hour and not seen an otter, walk 400m along the shore and there is five. 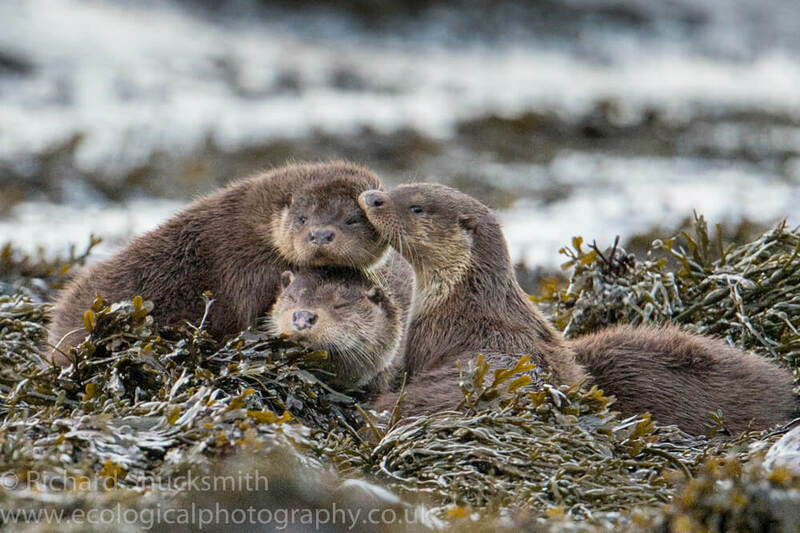 Mum and her three cubs were out on a seaweed covered point, rolling and rubbing their fur in the seaweed while one of the cubs was eating a fish, scorpion fish maybe; it was difficult to tell from my position. After a few minutes mum was back in the water, followed by her three cubs. Surprisingly, for the next 20 minutes she headed approximately a hundred metres out from the point, feeding along a shallow submerged reef. The sea was rough but it was interesting watching the cubs, as they synchronously dived following mum underwater, teaching her cubs to fish. Several times she caught small fish and ate them on the surface, with the cubs swarming round her trying to take the prey. Once finished mum would dive again, followed by the cubs. I imagined the cubs following mum closely underwater, watching her fish, learning essential skills for finding and capturing prey. Eventually the female caught a large fish, a rockling and headed back towards the point with the cubs in tow. She landed on the shore with one cub at her heels and the other two ten meters behind. The nearest cub took the rockling that mum passed to her daughter, once on the shore. The other two cubs landing on the shore could not see mum and started their high pitched squeak, a contact call to the female. 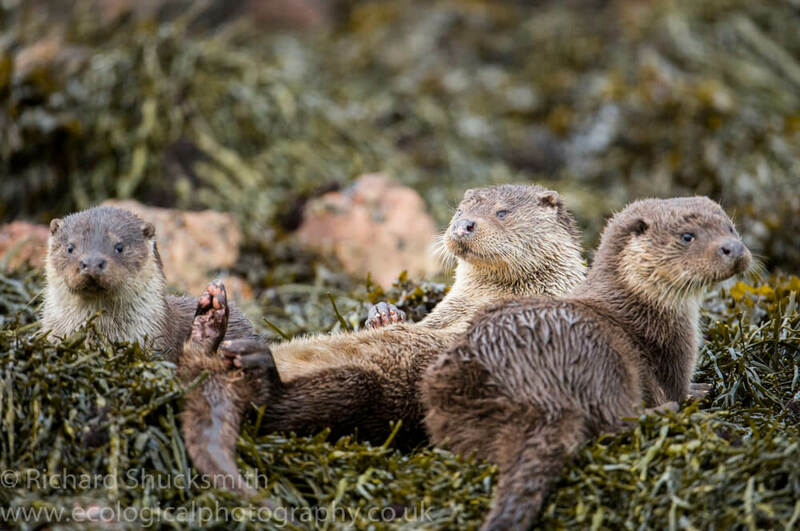 Mum went over to them, where they warmly greeted each other before they started grooming and rolling on the seaweed. At this point, I was in a great position; the otters were no more than four meters away. I was hoping they would rest, maybe even sleep and spend some time here. However, after a few minutes mum took the cubs back into the water and headed along the shore with purpose. I knew at this point she was most likely heading back to her holt but I was hopeful that she may stop along the shore a few times on her way. A couple times she caught fish, bringing it ashore for the cubs to eat, and she came out at a freshwater burn for a drink before carrying on her way, the cubs following. Not far from her holt, she caught two fish in quick succession, bringing both ashore for the cubs with mum heading back out fishing. Once they had finished their fish, the cubs started the familiar high pitched squeak, looking for mum who was out trying to catch them more fish. Ten minutes later mum came back collected the cubs and headed to the holt, where they all quickly disappeared inside. It was a 11:30 am and it was all over for the day. Even though it is the middle of the day and the sun was out, at this time of year it is low in the sky. I was shooting at ISO6400, to try to give me a reasonable shutter speed while using a long lens. Thus trying to avoid soft images through slight camera and lens movement. I contemplated heading back to the van and home but it was a nice winter’s day so I walked a mile or so along the shore, round an island back, looking for more otters. 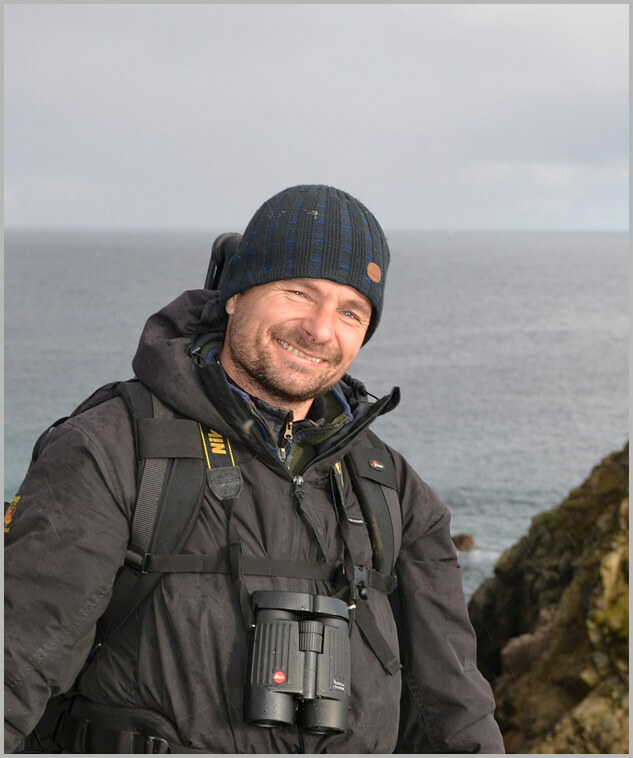 It felt good to be out walking the shore again, watching the numerous common seals hauled out on the island, many seabirds such as shags, black guillemot, fulmars and kittiwakes feeding along the coastal edge . 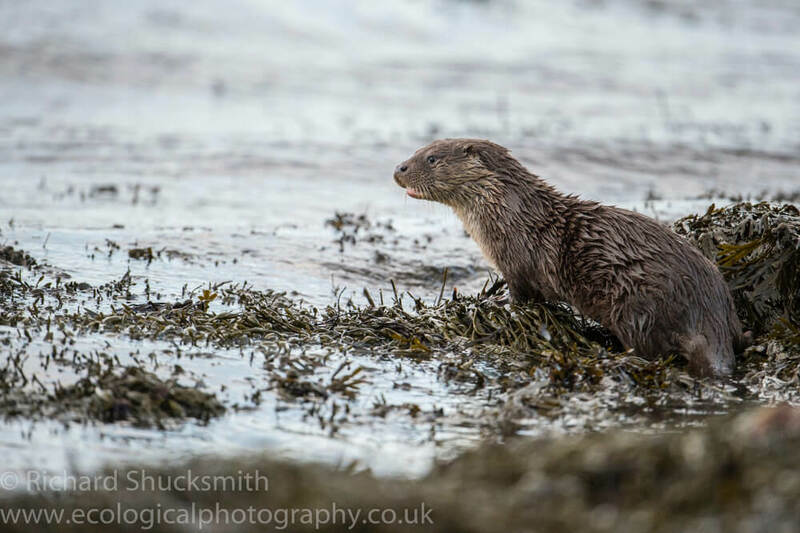 I saw many signs of otters but only came across a single otter that was feeding in a fast tidal flow before heading towards the island. I watched it for an hour but it curled up and went to sleep on the island, so I made my way slowly back to the van without seeing another otter. It was a lovely, (I would like to say evening but it was only 2:30pm) moody sunset. So I went the coastal road home and took a few images looking across the bay on what was a lovely day to be out with Shetland otters. 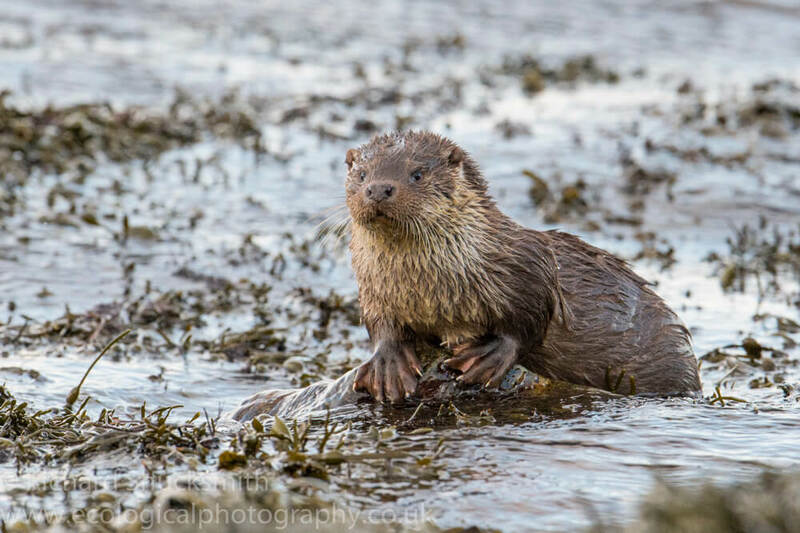 Where are those Shetland otters?